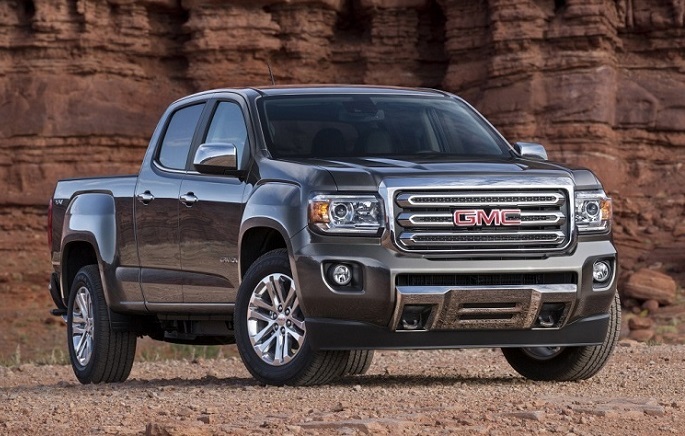 The GMC Canyon is mid-side truck which delivers more civilized, fuel-efficient and comfortable ride than full-size ones and most of its class mates. For those who don’t need heavy-duty towing ratings and also want more maneuverable size, this truck would be great alternative. It is closely related with Chevy’s Colorado and main rivals are Toyota Tacoma and Nissan Frontier. Its position in the brand’s lineup is bellow the full-size Sierra 1500. The company has returned this nameplate in 2015 after absence of two model year. Back then, it was all-new, engineered on the new body-on-frame architecture and capable for impressive payloads. Two engine options and two transmissions were offered and interiors were notably improved. The next 2016 model added new four-cylinder diesel engine and infotainment system was upgraded to support Apple Car Play. For the upcoming model year the 2017 GMC Canyon will be carry over except it will add posh Denali trim. On the performance front, the new 2017 GMC Canyon continues armed with three engine options. The base solution will be a 2.5 liter inline four cylinder engine which can make around 200 hp and torque of 191 pound-feet. It will be enough for fine job and good fuel economy. This engine will work in combination with either six-speed manual or six-speed auto transmission and two- or all-wheel drive. Expected fuel economy will be around 22 mpg on the combined basis while peak towing will be up to 3,500 pounds. The towing bar and power and torque figures will be pushed up with a 3.6 liter V-6 engine which is available with a six-speed automatic gearbox. It can deliver 305 hp and 269 lb-ft of torque. In case of this engine two-wheel models will return 21 mpg combined while with power on all wheels it will be rated at 20 mpg combined. V-6 propelled models when properly configured will allow up to 7, 000 pounds of towing capacity. The GMC Canyon will also offer a turbodiesel 2.8 liter four-cylinder engine which will be available on SLE, SLT trims including also new Denali trim. This engine is capable for 181 hp and max torque of 369 lb-ft. With this engine a six-speed auto transmission will be standard and 2WD or 4WD versions will be available. Diesel-powered Canyons will allow up to 7,700 pounds of towing capacity. The 4WD Canyon models will include manually selection all-wheel drive or it can be flipped on auto mode which automatically detects wheel slip and transfers torque front to rear according to needs. Locking rear differential is also available in higher trims. The suspension will include coil over shocks setup up front and rear side will be underpinned with rear axle and leaf springs. This configuration will be good to provide good ride quality and handling and things will also be better thanks to well-weighted steering system. When it comes to its exterior look, the Canyon is one of the best looking trucks in industry. It blends some traditional pickup truck cues with some modern details. It will enter in the new model year essentially unchanged in this context except that Denali trim will add some exclusivity. This new version will exhibit unique chrome grille, new 20 inch wheels and more chrome will be around fog lights, side steps and exhaust outlets. Interior of the 2017 GMC Canyon will be designed with high-quality materials, comfortable seats, well-arranged commands and more space than most of its rivals. Soft on touch surfaces, nicely designed center stack, supportive and comfortable seats are comparable with SUV designs. Improved sound insulation provides quieter cabin. Its IntellLink infotainment system is intuitive and easy to use and supports smartphone integration. The cabin of new Denali models will include leather and perforated black trim and will add heated and ventilated front seats. There will also be unique instrument cluster and Denali logos will also distinguish interior of this version from the rest of the lineup. This mid-size truck will be available in two cab styles including extended cab and crew cab versions. Extended cabs will come with two or four seats while crew cab model offers seats for five. Two bed lengths will be available and trims range includes SL, base Canyon, SLE, SLT and new Denali grades. The base SL trim is available on extended cab models. These models will be equipped with 16-inch wheels, daytime running lights, auto projector headlights. Inside of these versions will be vinyl upholstery, air-conditioning, four-way power front bucket seats, power windows, six-speakers, an 4.2 inch color display and so on. The base Canyon trim will be available on both cab stiles and it adds cloth upholstery and carpeting, remote keyless entry, IntellLink system with voice commands, Bluetooth, OnStar with 4G LTE and Wifi, etc. Options for this trim are rear locking differential, trailering package, a spray-on bed liner, etc. If you chose SLE version, it will have 17-inch alloy wheels, side mirrors with power functionality, a tilt and telescopic steering wheel, an 8-inch based infotainment system, satellite radio and so on. This trim also can be had with All-terrain package which adds off-road hardware like all-terrain tires, special-tuned suspension and more. The SLT trimmed model will include all from previous trim but it will also add 18-inch wheels, chrome exterior inserts, leather upholstery, navigation, premium Bose sound system and will be available with All-terrain package. The new Denali trim will bring 20-inch aluminum wheels, unique chrome details and Denali logos, Mulan leather seats, heated and ventilated seats, enhanced connectivity and so on. The safety rig will include anti-lock brakes, stability and traction control, rearview camera, airbags, and trail sway control. There will also be OnStar telematics system and higher trims will also include forward collision warning and lane departure warning. The official date and pricing for the new 2017 GMC Canyon haven’t been announced at this time. However, the production should start in October this year and it will likely go on sale late this year. As for the price it should start from around $22k while new Denali trim should cost around $38, 000.